Eva P. Blutinger, M.A. is a Certified Instructor of Kripalu Yoga. 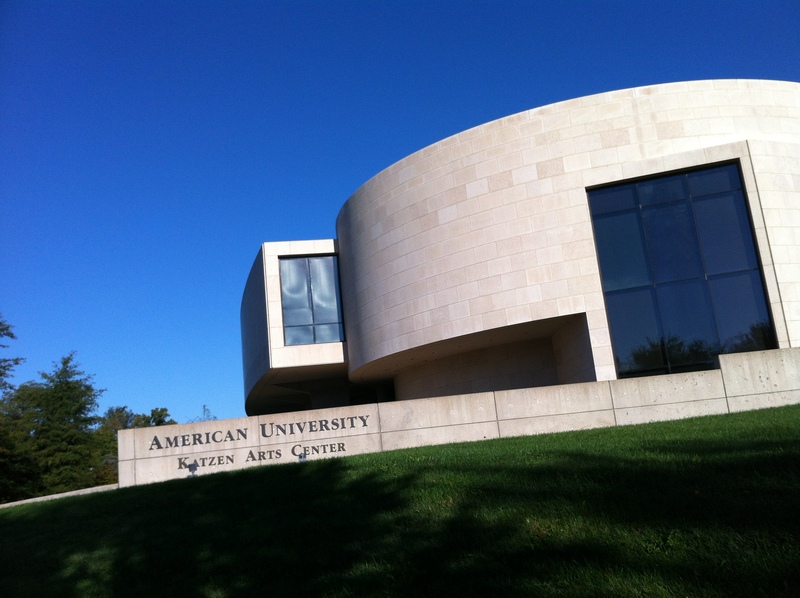 Twice a month, she leads Yoga in the Galleries at American University Museum. So I decided to follow through on my plan to go to American University Museum at the Katzen Arts Center to participate in Yoga in the Galleries, a fortnightly yoga program led by Eva Blutinger (see above) in the gallery space. On this occasion, the program took place on the third floor, currently home to an exhibition titled Memorial Modeling: Peter Belyi and Petr Shvetsov. While I generally attend a museum program with a preconceived notion of the topic for my corresponding post, I never seem to follow through on my original plan. This is one of the truly fun parts of my blog project; the topic I plan to write about is always supplanted by a new, more compelling idea—usually something that resonates with me in the days following my visit. I initially thought my post about Yoga in the Galleries would be primarily about movement in the museum. However, after participating in the program and emailing with Eva, I came to understand that the program is about much more than simply working out in the museum. It is about focus, self-care, self-expression, and complementary artistic practice. From my personal experience, it was also about using the body as a vehicle of engagement. From your perspective, what is it like leading the class in the museum space? I can’t think of a more perfect venue for teaching yoga. The gallery is a place of introspection and awareness of one’s self and that is the message I try to convey. Yoga is all about focusing your attention inward and being in the present moment. Does the museum contribute anything unique to your experience and your teaching style? The museum has an air of contemplation where you can focus on yourself. It’s kind of magical to go through the quiet physical routines of yoga movements in the quiet and tranquil environment of the museum surrounded by these great works of art. Yoga is about self-expression and, like the works in the gallery, a form of art – so practicing in the gallery is the perfect venue. Do you find the museum space accommodating of yoga? Is there anything challenging about the space? It’s the perfect space. It’s serene and meditative. Practicing yoga amidst the artwork gives us a chance to appreciate the artwork since much of yoga involves focus as part of our routine so what better place to focus than in an art gallery. Two posts ago, I wrote about the power of museums to bring people together, nurture relationships, and trigger moments of social connection (see post). Today, I propose that sometimes, museum experiences can simply be about you and your relationship with yourself. The museum has a quietly spiritual quality that makes it ideal for contemplative, meditative, and deeply personal experiences thereby supporting creativity, imagination, and wellness. Yoga in the museum offers the chance to pursue these expressive experiences in a focused way. It also allows the merging of two experiences—yoga and art—engaging the body as a lens for experiencing the museum and interpreting the art. Our body plays an important role in even the most traditional museum visit. It carries us through the space and, motivated by our particular interests, brings us closer to certain works and objects that capture our attention, allowing us to see more and learn more. Sometimes, where permitted by the museum, it allows us to physically interact with the objects. A friend recently recounted her experience visiting a past exhibition at the Corcoran Gallery of Art, Beyond the Frame: Impressionism Revisited, the Sculptures of J. Seward Johnson, Jr., which featured life-size sculptural interpretations of well-known impressionist works. She described the experience as fun and memorable, recalling how she and her daughter took numerous photos of themselves physically interacting with the works. Clearly, our bodies can offer new ways to relate to art when given the opportunity. The first thing I noticed as I settled in to the yoga class and rolled out my mat was how noticeably awesome it was to be barefoot in the museum. I definitely felt more free and playful than I usually feel in such a typically formal space. As the class got underway, I began to notice the installations by Peter Belyi and Petr Shvetsov that surrounded me. Every time I lifted my gaze, I saw the ceiling installation (instead of a nondescript gym ceiling). And every time I moved into a new pose, I saw and appreciated the artworks from new and interesting angles. The yoga practice was literally giving me a new perspective on the art. Ordinarily, I would not have the necessary attention span to look at the same gallery of works for a full hour. Most people wouldn’t, I suspect. But through the lens of yoga practice, I found myself in a deep, focused relationship with these works. Considering that, as far as I could tell, the exhibition consisted of just a handful of installations, my sustained attention is even more noteworthy. Not only was I present in the moment, I can remember a great deal of detail about these works even a week later. Most saliently, I remember a compelling beauty in the artists’ portrayals of destruction and decay. I don’t know if I would have noticed this had I simply wondered through the gallery space as a regular visitor. Engaging with art through the body seems like a promising area for further experimentation. Yoga programs in museums are becoming increasingly common. I wonder also about the possibilities for dance programs in the museum after finding this video by VincaniTV featuring art interpretation through dance at the Crocker Art Museum. My experience at Yoga in the Galleries reminded me of one of my favorite museum essays, ‘A Museum is an Open Work’ by David Carr. Carr (2001) argued that museum narratives are augmented and deepened by their users in unique, personal ways. He also suggested that the museum’s role is to facilitate, broaden, and advocate for this kind of user-driven learning (Carr, 2001). Experiencing yoga through the museum (and the museum through yoga) gave me the opportunity to engage in a uniquely personal and creative way. The program provided gentle guidance for my museum experience, allowing me to connect with myself—something I particularly needed on that day. 1 Laura Starecheski presented Why Saying Is Believing — The Science Of Self-Talk on October 7, 2014 on NPR where she discussed the work of psychologist, Ethan Kross, who studies the use of self-talk in the third person.